Savage No.4 Mk 1* zeroing question? Quote Reply Topic: Savage No.4 Mk 1* zeroing question? With the rear sight in the down position, the peep sight is the main battle sight set for 300yrds, so using that sight your 6-oclock hold should be a bit lower for POI at 100yrds. If you flip up the battle site and screw the aperture down as far as it will go, it should show slightly below the 200 mark, that will get you closer at 100yrds, but still a 6-oclock hold. This is assuming your rifle has original sights and hasn`t been knackered. The men who used these battle rifles learned to adjust POA to hit targets with 300yrd main battle site, at 300+ yrds aim at the crotch area for a centre of mass hit. Personally if the rifle is original, I wouldn`t mess with the sights, shoot it and let it teach you where the POA should be a varying distances. With the target sight raised go 4 clicks below 2 use MkVII ball or commercial 180 gr. I was curious what the fixed battle apature height is on the Mk 1 rear sight. So, I took two of these sights and held them back to back, aligning the battle apature on one sight with the adjustable apature on the other (keeping the axis pins at the same horizontal position). I found the battle apature to correspond to about 400 yards on the adjustable apature. I could not find a consistent reference for what elevation the battle apature is fixed at, perhaps someone else knows. Ive read it is “300 yards with bayonet attached” and “up to 400 yds”. I also read it was fixed at 200 yards. It was standard procedure to not attach the bayonet at longer ranges, but if the enemy closed to 300 or less the command to "Fix Bayonets" was given. The L-E had many subtleties in its design & this was one of them. As you attached the bayonet to the Number 4 rifle the zero changed from 400+ to 300yds by the altered harmonics. Its also yet another reason for the odd spring loaded SMLE barrel, which did not alter as you fixed bayonets. Shamu, this was also my conclusion. The battle apature provided a 400 yard zero with no bayo and a 300 yd zero with bayo. Center of mass aim would result in hits at any range up to 400 yards. Yes we were taught to aim at the bottom of the "V" of the uniform jacket. Failing that the top of the belt of the web gear! A lot of the older drills & practices, particularly the "figure" series of targets concentrated on COM aiming as well. As a new owner of an Enfield. I try to learn as much as I can from all sources. I watched the video posted on this forum with the two guys in uniform shooting one of the training courses that was used for marksmen ship purposes. One use the sight with the sight in the up position, the other used it in the down position. I believe the rifle they were using was what I have a No.4 Mk1*. The second shooter used the down sight and I think they referred to it as a ghost ring. Both men stated that with failing light the ghost ring was more useful in low light conditions. 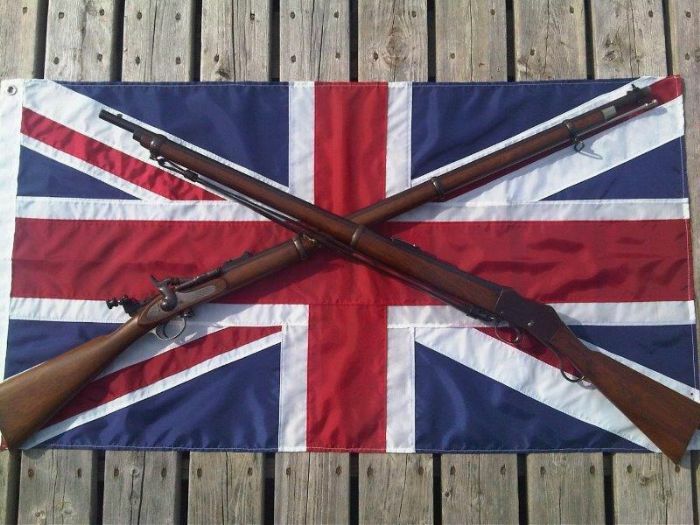 I want to hunt with my Enfield and I do not want to in anyway shape or form mess with the configuration of this rifle. It is bone stock military and will stay that way till I take a long dirt nap. 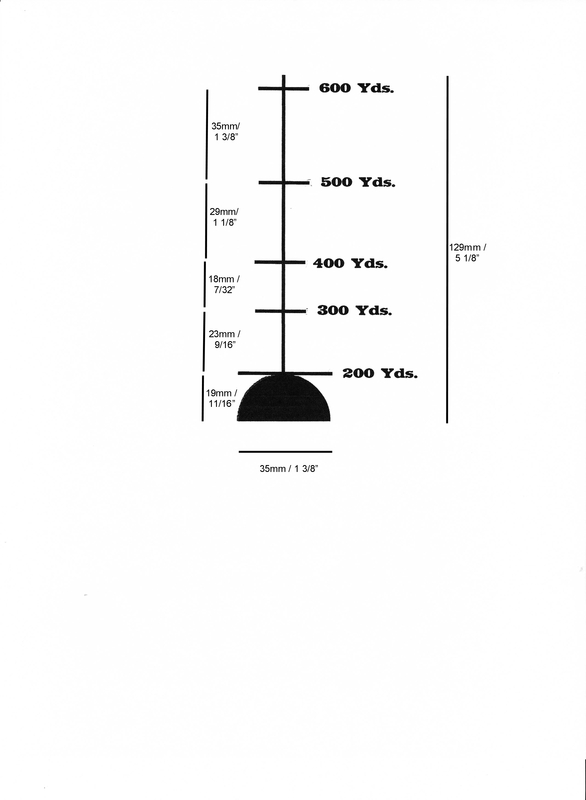 Now knowing this information can anyone tell me what front site height I need to get it in the x ring at 100 yards. I hunt Pa. and there are very few areas that I can shoot at a greater distance. I feel comfortable with holding over or under a target once I have it hitting where the rifle is looking at 100 YDS....Please feel free to add what info you can. Go for 2450 FPS with a 180 Gr bullet. Thank you Shamo I will load to that FPS. Or as close as I can get it. "The men who used these battle rifles learned to adjust POA to hit targets with 300yrd main battle site, at 300+ yrds aim at the crotch area for a center of mass hit." My scope has both range finding & BDC abilities, but yes I also have aim offs for those situations where there is no time to "twiddle the knobs" & you just aim off of your zero. What are these "clicks" you folks speak of ? My Savage has a simple L type rear sight. Then you don't have any. You could use the ladder target to zero by aiming at the "tin hat" at the bottom, "Making a Mushroom" with the sight blade & but adjusting for bullet strike on the "300" rung of the ladder. Its calibrated for 300/500 yds only. 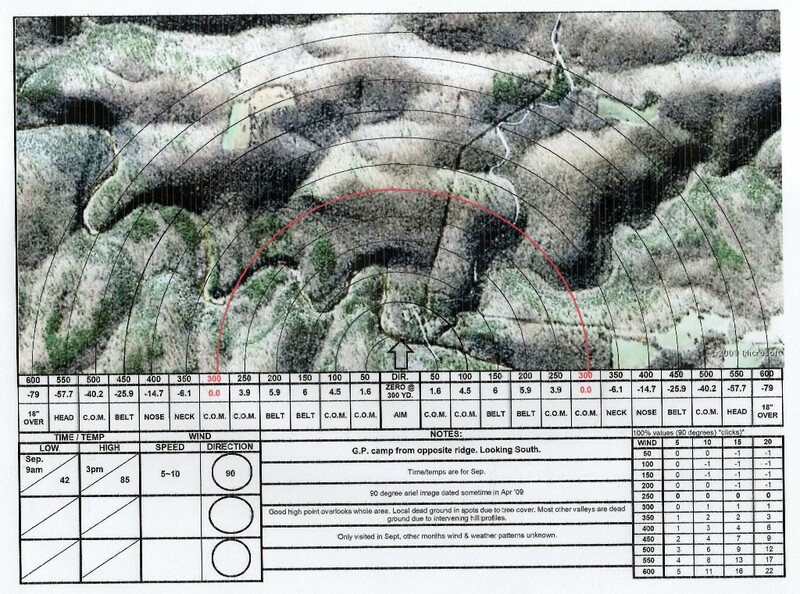 Print it out to fit an 8 1/2X 11" sheet @ 100% (or draw your own using the measurements) & shoot it at 25 yds.